There was a huge, pure White Ship in the scene which represents the spotless Church. Ships, in general represent the church. My mother has represented Word Church or fundamentalist doctrine in the past and there is no reason to think she does not represent the same here. I was in my mother’s house in a meeting with people I didn’t know and people I did know. Suddenly in the scene I was watching myself walking back and forth across this black line that was between the physical and the spiritual realm. The line was there among the people, but they were not or could not do what I was doing. I was talking to the people who were on the physical side of the line as I was working, seeing, and hearing what I was to do and say on the spiritual side of the line. I kept telling them, “It has to be narrower.” A great White Ship was being built in the spirit on the spiritual side of the line, but the people were building it too broad, too wide. I was suddenly on the spiritual side of the line and at this point I took my hands and pulled the ship’s hull together (depicted by the arrows in the picture), making it very narrow where it cut through the water. The whole hull had to be much narrower than people had thought. I was working on a big piece of this ship in the spiritual, while telling the people on the physical side of the black line what had to be done in the physical. There were several white pieces or sections to the ship that were there in the spiritual that had not yet been assembled. Then I was no longer seeing into the spirit realm and was crossing over the black line between the ship and the physical. I was now physically back in the meeting. I saw a friend in the Lord; I walked over to him and hugged him. Something was wrong. I asked him how he was and he said he was fine, but I knew better. I asked again and he gestured he was fine. I think I asked three times. I knew he was into Word Church doctrine and was not wanting to speak anything negative. I looked at him and told him that I had learned something…. In the scene it is revealed that the way to become a spotless church or the married Bride of Christ is much, much narrower than most Christians think. The hull of the ship being narrower makes a lot of sense when you understand that the spotless church travels the information from the River of Life flowing from God’s throne. This scene reveals there is a certain (pure) way for Christians to do all this. The Lord said that the way is narrow that leads to LIFE! This scene was given in 2008. The Lord has continually given more understanding and I have a much clearer picture now. This has produced more information for the Lord’s people as recorded on this site. I was very saddened when I had the scene because I knew some of the people who were not paying any attention to what I was telling them about the White Ship in the spirit realm. Some of the people in the scene had even attended the first Marriage Feast of the Lamb meeting explained on this site. In the scene I was telling everyone that the way to being the married Bride of Christ is narrower than they believed. But in the scene they continued doing what they had been doing. Man’s idea of church just doesn’t measure up when it comes to being the disciplined Bride of Christ. 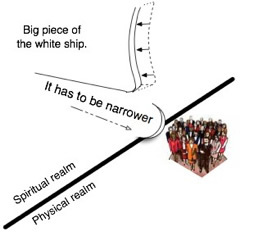 The White Ship represents the Lord's way of doing things, they don’t mix with man’s ways, to produce the perfection the Bible and the Lord talk about. Thinking back on the ship scene, the people knew what I was doing, but they were not paying any attention. Sadly, through the years I have seen people try to put one foot in the Bride and leave the other foot in the harlot and this does not work. The Spotless Bride was ordained by God in the beginning and we cannot change what He expects from His Bride. I have also seen people fall away from the information because of the cares of this world, just like the parable of the sower reveals. We have seen miracles and some are reported on this site. I’m not talking about miracles from the gifts of the Holy Spirit operating. I’m talking about miracles of the power of God with people who have learned the ways of God. Miracles paralleling what happened at the battle of Jericho. A lot of Christians misinterpret and miss God because they don’t know the ways of God Himself! The Kingdom is around us and the Bride walks in that Kingdom. We must all learn the protocols to walk in the Lord’s Kingdom, just as we need to know the rules of driving a car on roads to have a safe trip. It is all a learned thing. This is what a big part of this site is about! Here are a couple of excerpts from Individual Golden Meetings that have been reported to us. Trespass not allowed. What about trespass? My way of doing things, My functions, My protocols. Please understand these are for My purposes, not yours. Therefore learn them, as I will have silence before Me. I AM HOLY, therefore should be treated as HOLY. Nothing less will suffice. Do. The silence away from the world, seek Me here. Yes Lord. Holiness, reverence, honor, discipline, justice, righteousness; in these I delight. God used the Temple in the Old Testament so we could learn Golden Meetings protocol and how to let the Lord be the head of the meeting. One needs to understand (much more than known to people) that Jesus ran Israel out of the Holy of Holies. What a person learns from reading this site about meetings is not a game. It is serious and has everything to do with the Lord leading His people so they can become part of what He is doing in the earth. Jesus was in the Holy of Holies in the Old Testament, but the Lord has taught us how to tabernacle with Him in a meeting without the walls of the Holy of Holies. He wants every Christian to learn how to do this, for their own good. Don’t be a person who is waiting to see what happens before you learn! Jump in and find out for yourself. It’s not as hard as it may seem and your relationship with the Lord will be of a caliber you never thought possible!